Some of the details still need to be worked out, but the Southern Shores Town Council says it is willing to help pay for the initial phases of a new fire station. The Council told Town Manager Peter Rascoe Tuesday night to include $267,700 in his proposed budget to cover the town’s share for design and bidding on the project. Rascoe and Fire Chief Edward J. Limbacher have written to the Chicahauk Property Owners Association about the possibility of leasing land at Dolphin Run and N.C. 12 for the new station. 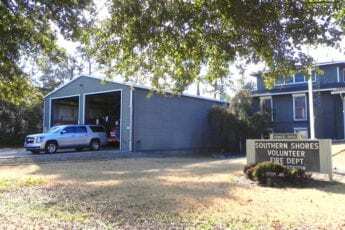 The association has not responded, however, so the town and the fire department are proceeding with plans to build on the site of the current station on South Dogwood Trail across from Kitty Hawk Elementary School. That site can accommodate a 12,951-square-foot, four-bay station, which is about 2,500 square feet smaller than the facility earlier envisioned. The town would need to make some adjustments on parking requirements. Total cost estimates range from $4,273,830 to $5,050,890. The project would take at least two years. PNC Bank estimated that a 10-year, 4-percent loan on the low end would mean annual payments by the town starting at $598,336 and declining each year. The fire department’s annual payments would be $236,667, amortized over 20 years. The fire department paid $19,600 for the “Existing Facility & Program Needs Assessment” by its architect. It is also paying $5,000 for a required site survey. The Town Council will begin to work on its budget for fiscal year 2017-2018, which starts July 1, in two weeks. Its action on Tuesday does not yet commit the town to a 10-year debt to build the new station. Limbacher says the new facility is necessary to meet standards for fire protection. Beside providing protection, a modernized fire department can keep insurance rates down for the town’s property owners. The fire department is not a city agency. It is a separate entity that contracts with the town to provide fire protection.